I’ve long been fascinated by stories of wolves in Carroll County. I can recall sitting with my grandfather, Jack McCall, on cold winters’ nights asking about wolves. He would spit tobacco juice into a coffee can at his feet, feed the stove another stick of wood and patiently answer my questions. I’ve heard the opinion that Carroll County never had any actual wolves, that the old tales were of coyotes. I’ve no doubt that Jack McCall would have been surprised by this argument as wolves and coyotes not only looked different, they sounded different. In his day he killed wolves for the bounty and because they killed sheep. 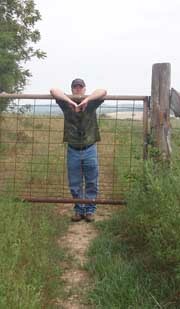 Later he killed coyotes because they preyed on his chickens and ducks. In his mind, the two types of animals were not the same. Wolves were bigger and carried themselves differently when they moved. In John Sealander’s A Guide to Arkansas Mammals, he recounts an Arkansas Red Wolf specimen tipping the scales at 90 pounds. Out west coyotes seldom weigh more than 35 pounds. The Arkansas Game & Fish Commission says that in the 1940s Carroll County had one of the largest populations of wolves left in the state, the reason being that the small farms and woodlands made for good habitat. Each year the number of pure wolves dwindled, though, as they were hunted by man and interbred with coyotes. In 1965, the U.S. Fish and Wildlife Service listed the Red Wolf as endangered. In 1966, Carroll County still offered a $15 bounty on wolves. By 1980 Red Wolves were officially extinct in the state of Arkansas. Late in life, Jack McCall, not one for giving a predator an even break, was wistful about the disappearance of the wolves from Carroll County. He wondered if it was man’s place to annihilate an entire species. Last night I walked up the hill to lock in the chickens for the night and found this long individual hanging around the hen’s nests. 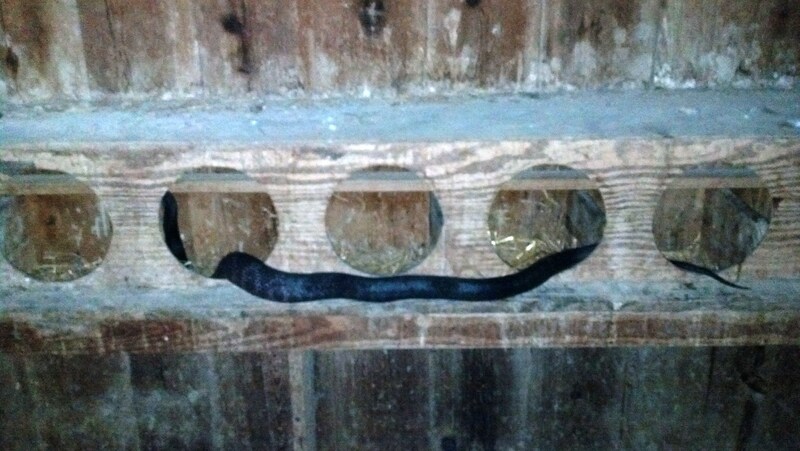 I’d not seen this particular black snake for awhile so had wondered if something had happened to it. My presence didn’t seem to concern it too much and it continued looking for eggs. The hens and the rooster, Russell Crowe were occasionally talking at the snake, but they didn’t seem awfully worried. I don’t want to exaggerate, but it was a six footer, at least. It was as long as the width of my wingspan, which is six foot. 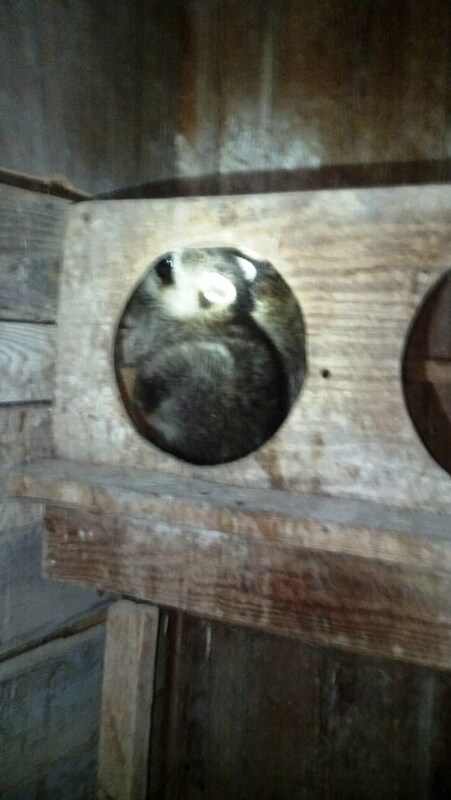 Tonight there were two young raccoons in the hen house and they were scared senseless by my presence. It took ten minutes to finally convince them they could safely leave. I was so glad that I had a broom in there to chase them with. At first they wouldn’t leave the corner nest and were climbing all over each other trying to hide. Finally they left the nest after lots of poking, but then they climbed the chicken house walls and would try to hide up under the roof. Then they left these hiding places, each nearly landing on me as they leapt from their high perches. The first one found the exit pretty quickly, but the second couldn’t. It kept running into the wall searching for the door. I’ve always thought of raccoons as being pretty bright, but I suppose they are like people – when they are frightened out of their wits they lose all sense. Not the best photograph. We recently drove the length of the Florida panhandle. After observing thousands of hermit crabs on the beach at a state park, we decided to drive to the small town of Carrabelle to eat at the Fisherman’s Wife Restaurant. We pulled up just as the open sign was switched off. At the next restaurant, a barbecue place, the owner let us in though it was also her closing time. Inside the restaurant were three customers, two of whom were cops. We traipsed in sunburned and trailing sand and headed to our table. I was wearing my Arkansas Razorbacks t-shirt and one of the cops said, “The only problem with you coming in so late is that you’ll have to call the hogs before we let you leave.” Woo. Pig. Sooie. Off in a corner was the weatherworn third customer, a man in the middle of a 13-month journey circumnavigating the lower 48 states on a bicycle. He planned to set up his tent by the restaurant that night despite the alligators. One of the kids commented later that it was like an episode of the Twilight Zone. The cop turned out to be a nice guy with the goal in life of living on Beaver Lake part of the year so he can attend Razorback football games. He told us that before we told him where we’re from. Small world. That is my point, the word is out that this is an interesting place to live and the numbers prove it. While Eureka Springs proper has only had modest growth the last few decades, the population in Carroll County west of the Kings River has more than tripled. In 1960, it was only 2,844, while today it is 8,728. A large portion of that is the Holiday Island boom, but all those houses edging Beaver Lake have people in them, too. And as I was told by a local Realtor, they’re not making land anymore. The best I can figure, Carroll County west of the Kings River covers 103,101 acres. At the present population, that comes out to 12 acres per person. Tend it wisely. Below is the “Notes from the Hollow” column from the August 15, 2013 edition of the Eureka Springs Independent newspaper. That’s a curious statement. Is it really that easy to become a native Eurekan? It only takes five years? Not all Eurekans are native born, of course, so who qualifies? I don’t know exactly. My children are sixth generation Weemses here, and yet we actually reside outside the city limits. Does that disqualify us as Eurekans? Just how does one prove one’s bona fides? To be honest, I was born in the Eureka Springs Hospital, but I’ve only clocked half my life here. Is that good enough? Home has never been anywhere else, but maybe I don’t make the cut. 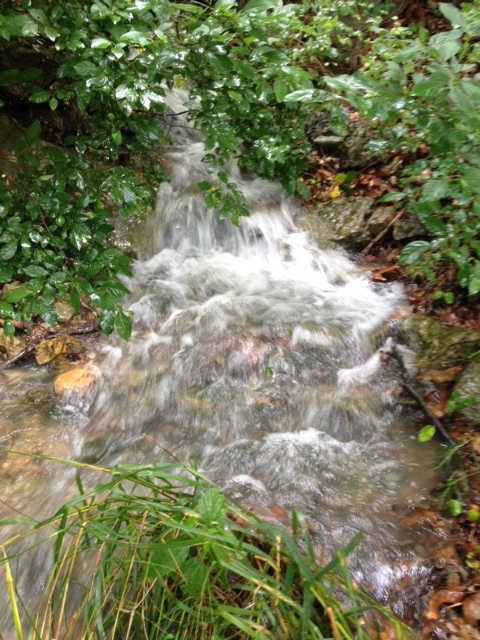 Certain hard-boiled natives, long-term residents and ex-pats see Eureka Springs as being occupied by foreign forces. That’s a bit harsh. Their view of Eureka Springs is much different than that of someone who optimistically cashed in their 401k to move here and buy a business. And that person’s view is much different than the one selling out, leaving town bankrupt and bitter. Some say Eureka Springs isn’t a real town anymore. Sure, some locals only go downtown for the post office or to eat at Local Flavor, but that just means the town has changed. Whether for better or worse is for you to decide. I’ve heard it both ways. What of the many Eurekans who have moved away for a living wage, to be near children or just to experience the real world? Are their passports confiscated on the way out of town? I think a true Eurekan always comes back, whether it be for short visits, to retire or maybe just to be buried. I once read in the newspaper that a city leader said something along the lines that we are all here because of tourism. That makes a nice rallying cry, except for those here despite the tourism. Some are here simply because it’s home.